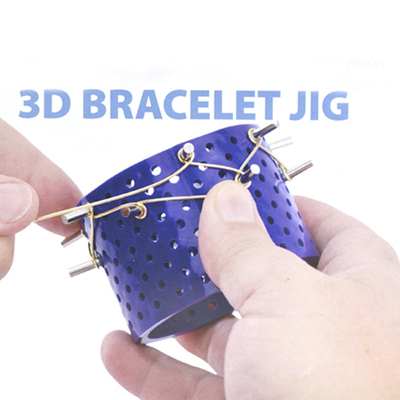 Create bangle bracelets, cuff bracelets, and curved components using the Artistic Wire 3D Bracelet Jig! Design perfectly round, continuous, all-in-one bracelets in 3 dimensions using wire, stones, and beads with this unique jig - even make curved design components for bracelets and earrings. Includes one Round Jig base with evenly spaced rows and columns of holes and 20 removable Pegs & 20 Peg Fasteners. Creates a 2.75 inch (6.29cm) diameter design that fits most wrists. You can also stretch your designs slightly to make larger or smaller diameter if desired. 4mm, Add another 30 pegs to your Artistic Wire 3D Bracelet Jig to crate even more intricate designs. 22mm (0.86in) length x 4mm (0.15in) peg diameter.